Turkey has conveyed its solidarity on the 44th anniversary of the 20th of July Cyprus Peace Operation, which allowed the Turkish Cypriot People to live in peace and freedom. 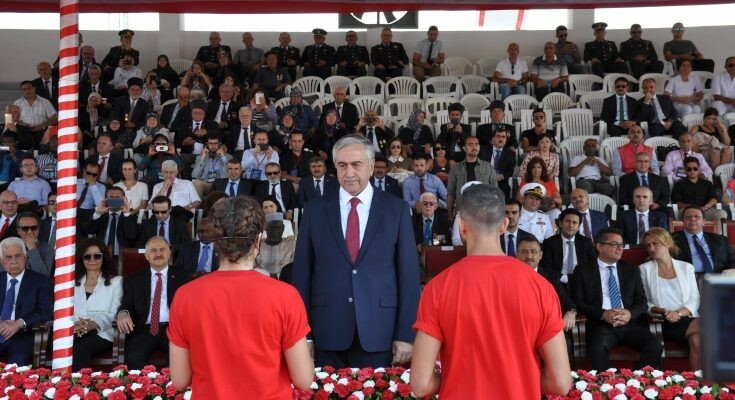 In a speech read on his behalf, Turkish President Recep Tayyip Erdogan congratulated TRNC and conveyed his joy and excitement on the TRNC Peace and Freedom Day . “On this meaningful anniversary, we share the joy and pride of our Turkish Cypriot brothers and sisters from the bottom of our hearts. The Peace Operation is a milestone for Cyprus as well as for the whole Turkish nation. This is the most honourabe day of Turkish Cypriot struggle towards their existence as the equal owner of the Island. Turkish Armed Forces have used its rights deriving from international treaties. Greek Cypriots’ attempt to destroy the Turkish Cypriots and annihilate them has not been successful. “Guarantor Turkey has shown the entire world, on that day, that it would support the Turkish Cypriots under any circumstances. In addition, the Peace Operation has helped the strengthening of peace and stability in our region,” President Recep Tayyip Erdogan said. The Peace Operation gave the Turkish Cypriots the opportunity to continue in security with its struggle for justice and equality. In this struggle Turkish Cypriot people decisively not only maintained their existence but also managed to establish their institutions. The Turkish Republic of North Cyprus today is contributing to peace and stability in the region as a modern state with its government, parliament, and all its institutions and bodies. Turkish Cypriots reached this point acting in unity and maintaining its values. As long as TRNC maintains its unity and belief in the national cause, there are no obstacles it cannot overcome. The leaders of the TRNC struggle are Dr. Fazil Kucuk and the founding President Rauf Denktas who are remembered with mercy and gratitude. There have been half a century long negotiations in search of an agreement on the Cyprus problem which came about as a result of Greek Cypriot usurpation of the partnership state, only three years after its establishment in 1960. The Turkish Cypriot side and Turkey have always worked for a fair, lasting and sustainable solution. The Turkish side has shown clearly to the international community its will for a solution in 2004 in the referendum for the UN Comprehensive Settlement Plan. It was the Turkish side again, which demonstrated a constructive approach during the last negotiation process which started in 2008 and ended in July 2017 due to the collapse of the Cyprus Conference. Unfortunately, the Greek Cypriot side continues to see itself as the sole owner of the Island and does not want to share political power with the Turkish Cypriot people. The same Greek Cypriot stance has yet again caused this process, which aimed at the establishment of a federal partnership, to collapse just as it did in the previous times. The Greek Cypriot mentality that aims at integrating the Turkish Cypriots into their so-called state has not changed since the collapse of the Cyprus Conference one year ago. Turkey has been following the recent statements made by the Greek Cypriot side with concern. “It is clear that expecting a change of this un-constructive mentality is not realistic. Unfortunately the Greek Cypriot side does not envisage a partnership with the Turkish Cypriots on the basis of political equality in the future. Any effort for a peaceful settlement can be successful only if it is based on the existing realities on the island. Any settlement could only be reached through negotiation , diplomacy and compromise. “As Mister President has emphasised on 10th of July, during his visit to the Turkish Republic of Northern Cyprus,Turkey will never allow the Turkish Cypriots to become victims of the lack of solution.Turkey will never allow Turkish Cypriots to be a minority in a Greek Cypriot state. The President of Turkey said the Turkish Cypriots possess the power and strength to improve their life standards. The unjust isolation which the Turkish Cypriot people are subjected to has no political, legal or moral grounds. The international community ought to put an end to this isolation at once. Despite all the restrictions, Turkey has worked with Turkish Cypriots decisively and in solidarity for a long time in order to make them economically stronger. With its joint efforts and sacrifices, TRNC’s developments and economic growth has become a source of pride. Turkey promised to continue to implement large scale projects to bring Turkish Cypriots to a higher standard of life, especially through investments that will forward economic development within the framework stated by President Recep Tayyip Erdogan. The TRNC has huge achievements in tourism and higher education which are the leading sectors of economic development. Today there are over 100,000 students in the Turkish Republic of Northern Cyprus studying in 16 universities coming from 131 different countries. The education given in these universities are at international standards and high quality. Over two million passengers arrive at Ercan Airport, in the Turkish Republic of North Cyprus, which has become a venue of touristic attraction internationally . This is of importance for the cultural interaction of TRNC youth as well. The drinking water problem of the island has been resolved to a large extent since water is brought through the pipeline that was built under the sea between the TRNC and Turkey. The work for the irrigation of the Guzelyurt and Mesaria fields is continuing. Hence agriculture will become one of the leading sectors of economy in the TRNC just like higher education and tourism. The common goal should be to aspire for more and go beyond these achievements and transform the Turkish Republic of North Cyprus into a source of attraction in the Eastern Mediterranean. It will be possible to see the results of the great achievements, also in the TRNC , that will come about with the implementation of the presidential system in Turkey . The freedom, the rights and the welfare of the Turkish Cypriots is Turkey’s national cause and the later’s priority is for Turkish Cypriots to live on the island in peace, security and tranquility. By maintaining mutual understanding and unity, Turkey promised to undertake the necessary steps with determination so as to overcome the possible problems just as it did in the past.